If you frequent my site a bit regularly, you may have already come across my review on the SteriPen Adventurer. Which is a fantastic little tool that I used all through SE Asia with zero problems. It worked perfectly for what I needed it for, but in my opinion, a better option when it comes to backpacking and camping is the LifeStraw. 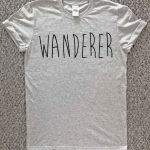 It totally depends on the type of traveling you’re doing, which countries you’re traveling through, and how much camping you’ll be doing while there. 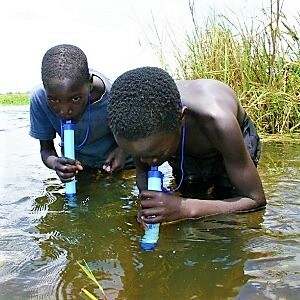 When I first came across the LifeStraw, it made me say, “hmmmm” out loud. It’s priced at only $17.00, and is pretty compact with no batteries or removable parts. You literally just pop off the caps on both ends and drink out of a lake, or pond, or river – just like that!? I was a skeptic, I’ll be honest. So I did a little research. LifeStraw has won Time Magazine’s Invention of the Year, The Enquirer Magazine’s Innovation of the Year, and the Saatchi World Changing Ideas award. Well that’s a good start, I thought. This inexpensive and compact little tool is capable of filtering up to 264 gallons of water, which is enough water for one person for a whole year. LifeStraw’s filtration membrane removes 99.9999% of waterborne bacteria, as well as 99.9% of protozoan parasites. It’s about as foolproof as you can get. What the LifeStraw cannot do, however, is filter the salt from saltwater, or remove heavy metals, chemicals or viruses. Not to worry, the probability of you running into these in the backcountry is pretty slim, but feel free to research this a bit more before deciding if this little gadget is for you or not. I like seeing what a product cannot do, it makes me feel like the company is being honest. The LifeStraw isn’t a miracle worker and it’s not magic, but wow. You might think so after watching the video at the end of this post! If you can remember to back-flush your LifeStraw by blowing a breath of air back into the mouthpiece after every use, it’ll help to keep it clean by purging all remaining water trapped within the filter. For my humanitarian friends out there, this tidbit is for you. For each LifeStraw product you purchase, one school child in a developing community is provided with safe drinking water for an entire school year. I love the gifts that keep on giving, and another one of my favorites is a fabulous camping and hiking gadget called the WakaWaka, which you can check out here. The LifeStraw doesn’t generally come in a clear tube, but the company sent a clear tube so that this dude could do an awesome review, check it out! If it doesn’t make a believer out of ya, I’ll be shocked! What are your thoughts on the LifeStraw? Do you own one? Have any personal experience with one? I’d love to hear from you, leave a comment in the comment section below! Yes, I love it! I couldn’t believe it took me so long to hear about it either! Thanks for stopping by! Your Lifestraw review really drew my attention. Why? Because I must have been living under a rock. As much as I like to keep abreast of things, I did not know, nor had I ever heard of this ingenious device. What a handy tool to have on your person while travelling the wilds. I watched the video, that guy is gutsy filling up with dirty water and drinking through the Lifestraw what was certainly much clearer and drinkable water. 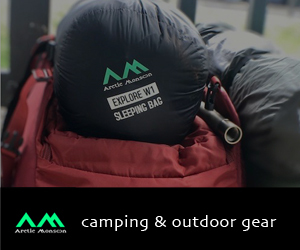 We don’t do a lot of hiking or walking but we do a lot of camping and this product is quite amazing. Will certainly be telling all of our camping friends about this one! Yeah when I first watched the video I was like, “eek!” but it all turned out okay! Send your camping friends my way, I’m always adding things they might find helpful. Cheers! I’ve been thinking of getting a couple of these for my daughter and I and am so glad I came across your review. I’m sold! I love a company that gives back also. I love that they give back as well! I hope you and your daughter enjoy the LifeStraw — come back and let me know what you think! This is great for survival situations. I had seen the Life straw many times before, but I was not aware that it did not remove salt from saltwater, heavy metals, chemicals or viruses. I definitely will keep that in mind. I also love how they are able to give back to those in need. Happy you liked the post, Hilda! Hope to see ya back soon! Sure, it’s possible to catch viruses through water, of course! But the fact that viruses are typically hosted by humans means that in places where there aren’t many humans hanging around (like the backcountry where you’d probably be hiking, backpacking, and camping), the probability of catching a virus is quite slim. Also the advanced sewage system throughout North America and Europe makes contracting a virus through water sources a very uncommon occurrence. Hope this helps! What a handy item for the nature lover! I love how the company pays it forward as well. Seems like one of those necessary items to have just in case. So many natural disasters these days and being prepared is becoming a necessity. I agree, Linda. Ya can’t ever be too prepared. I also love that the company gives back. It’s a win-win! LifeStraw seems like a very great choice for when hiking, back packing, fishing, or just out and about. I tend to have a HUGE gag reflex, and would have a terrible time even attempting to drink from a lake, river, or such. So even though this is a really great idea….for some…., and does have a great price, I would have to have something that had water in it already 😀 I could see my dad using this though as he is an avid hunter/fisherman. No worries! You’d probably enjoy the LifeStraw Go Water Filter Bottle. It would would perfect for you! Absolutely brilliant! Makes me think we should have a whole supply of them for the moments of natural disasters where drinking water is in short supply! I love this product, I really do! Yes, Wenda, that’s a fantastic idea. I definitely think they are worth the money! Stocking up wouldn’t be a bad call, considering all of the natural disasters going on right now. One can never be too prepared! Wow, I tell you inventions are getting better and better. This is a great product and so simple. I was going to say I would like it better if I could put it in a water bottle but then I saw that there was one that you could so that is great. Thanks for sharing this! Yep, LifeStraw does have other great products not reviewed on this page, perhaps I should include them here! Understood you can directly drink the water through the straw, pretty slick. But is there anyway to get water from the straw into a small pot or something if you wanted to boil it over a fire, or are you mostly stuck with the iodine tablets? If you had to choose one in your pack, a bunch of tablets or the lifestraw which way would you lean? Cool, thanks for the detailed response! Wow, I have never heard of this nifty tool, this is certainly a real lifesaver. This is just awesome! I couldn’t believe what I saw on the video. Thank you for sharing this. I do appreciate this information and the review. Happy you liked it, Sylvia! Thanks so much for stopping by! That’s unreal. I was amazed after watching the video. Definitely going to look into this as I travel quite a bit. Would this be useful for places like Cuba or anywhere in the Caribbean. Thanks for sharing. Sure you could absolutely use this … as long as you aren’t trying to drink salt water, the LifeStraw won’t filter salt from saltwater! Wow, this is great and is so affordable! Would it work for tap water in countries where the tap water may not be so safe to drink? I think it would be very useful for me then, and will save me water on water bottles. Absolutely, however the SteriPen may be more of what you’re looking for in that type of situation! You were right! After watching the video how could you not be amazed. My family and I have been discussing that we need to add water filters to our survival kits. This would be perfect because of it’s size and how long it would last us. Definitely a filter we will be adding to our kits. I would also like to say “Thank you” for the humanitarian aspect you allow with the purchase of this unit! Kudos to you and your product. Great site! Thanks so much Mark! Yeah these are fantastic for a “bug out” bag or any survival kit. And you’re definitely right about it’s size, it does make it super easy to stock up on. The video definitely sells this product!! Looking forward to seeing you around here again! That is a pretty cool item. My husband does a lot of backpacking and traveling and is always looking for light weight items. I would eventually like to join him and think this would be really nice to have. Awesome review and thank you for the information! Aww, ya should! I absolutely love being out in nature. I generally try to incorporate camping (generally without a tent) into my travels. Happy you liked the review!